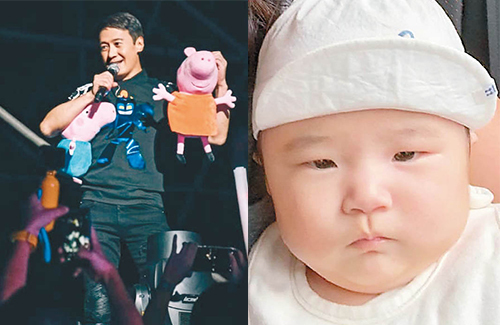 As a promise to his fans, the extremely private Leon Lai (黎明) decided to open the door to his home so the fans can get a glimpse of his family life. In April of this year, news media revealed that the 51-year-old Heavenly King has welcomed a daughter into his family. Her mother is his assistant Wing Chan (陳泳儀), who is 19 years his junior. According to reports, his daughter was born premature, at only 5 pounds. Now four months old, Leon and Wing’s daughter have grown into a healthy infant baby. I don’t remember what’s Leon’s girlfriend looks like…but this little chubby cutie does have her daddy’s features. I thought Leon has double eyelids? @mangotango even if the mother has double eye lids, the baby still have a chance of single eyelids? It’s like baby fever here. I love chunky babies!